With thy Needle & Thread: Winter has arrived! oh I do not miss that white stuff! Take it easy...as I remember, snow is heavy! It is never good to see a snow covered pumpkin. Take some breaks between the shoveling and make some hot chocolate. It looks beautiful - but I have to say, after last winter, I am no where near ready for the white stuff yet!! Hopefully your trees aren't damaged too much - take it easy! OMG!!! don't like the looks of your part of the country. We have been spoiled here in SE Michigan. I know some day we will pay for this wonderful weather we are having. It is too good to last. Love, love, love your teddy bear on your side bar. Be careful with all that heavy white stuff. Take it slow and easy!!! I love the pics of your winter wonderland, but I am happy to say we are still snow free here in NE. Maybe warm weather will melt it all quickly so that your clean up is easier. Punpkin looks like a smiling Jack Frost !! Looks beautiful to me.. Of course, I am in Alabama and it is still high 70's here. It looks wonderful to me! Of course I am sitting here in shorts and it was in the 80's and sunny here today :) I do miss seeing the white stuff but I do not miss driving in it or shoveling it! Nowdays I just get to enjoy it by seeing someones pictures. Yikes! I am definitly NOT ready for snow! 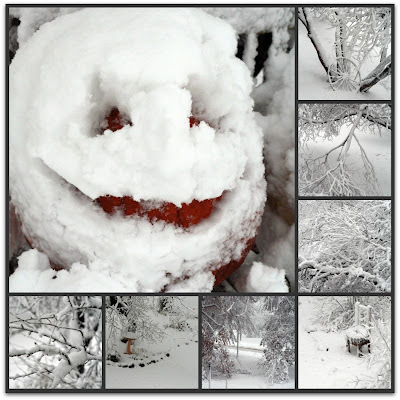 And even though the snow covered pumpkin is a neat photo and everything always looks so clean and pretty in the snow I do hope it melts fast. It looks wonderful! But I can imagine you don't feel that way... Good luck with the snow shuffling! The only positive thing of being stucked at home, is that you have a lot of crafting time!